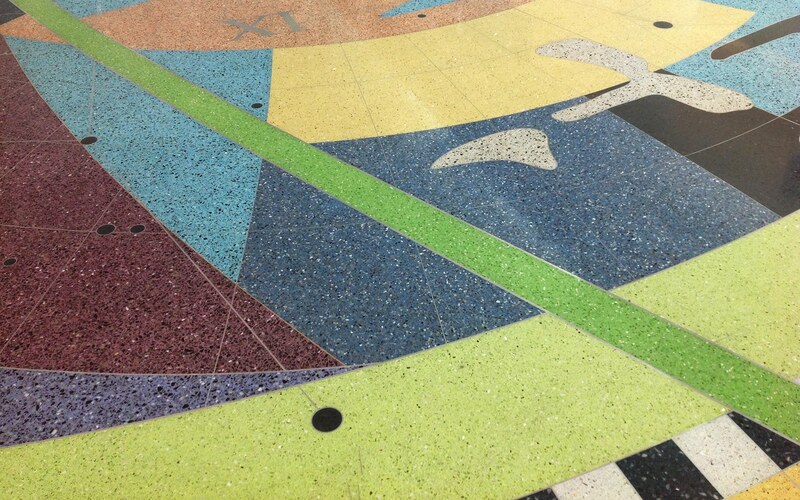 The design for the new Terminal Two terrazzo floor mosaic grew from my contemplating the function of an airport and the nature of travel. 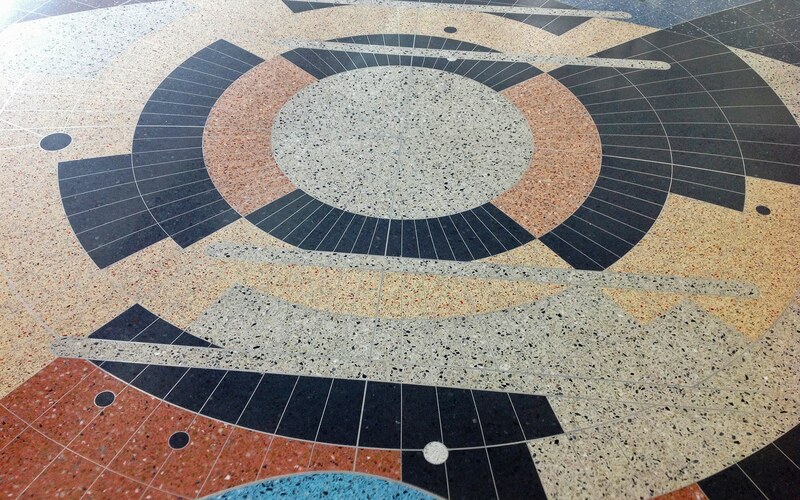 I call this terrazzo mosaic “Starwheel” because it reflects the beauty and diversity of the Minnesota landscape and the historical movement of people across these ecotones—beneath the movement of the stars. 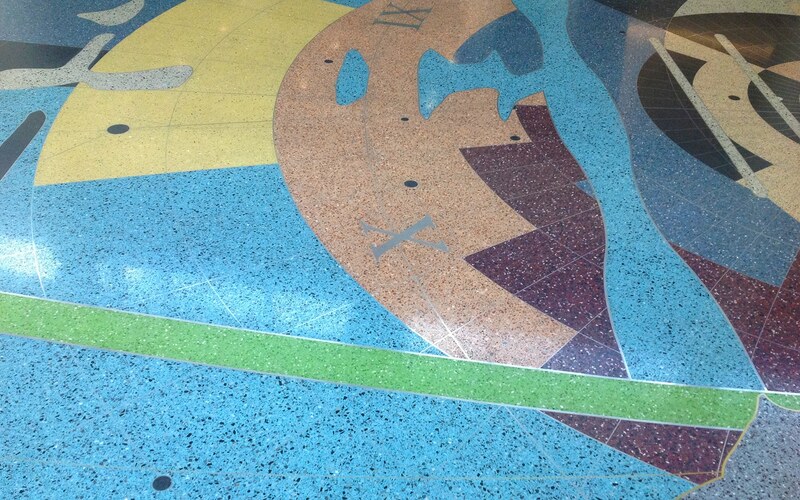 There are a number of constellations visible in the floor, including the North Star Polaris and the Little Dipper. All the other stars spin around Polaris which serves as a longstanding navigational marker of the night sky. I have represented the tall grass prairie by the flickering movement of early spring grasses I recorded near my home at Blue Mounds State Park this past spring. 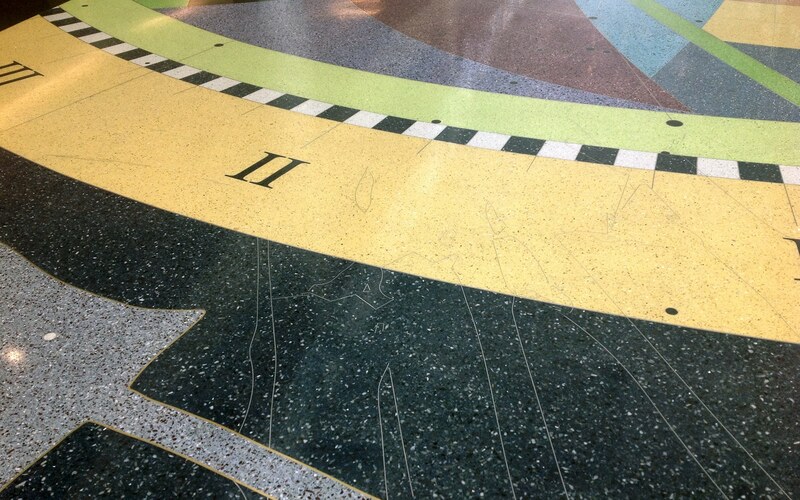 These are shown with thin 16-gauge divider strip on both ends of the design which appear and disappear into the dark sea of blue and yellows as you walk across the floor. 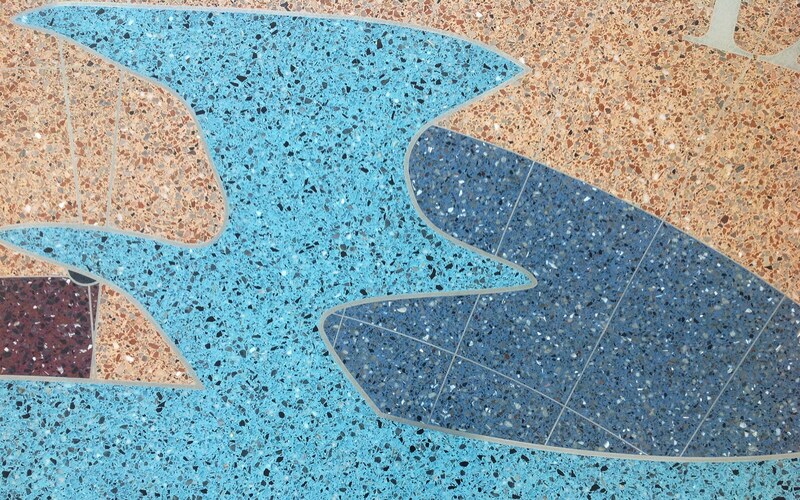 The navigational waterways—both rivers and lakes of Minnesota—are evoked through the large abstract depiction of a canoe’s ribs, thwarts and inwales. 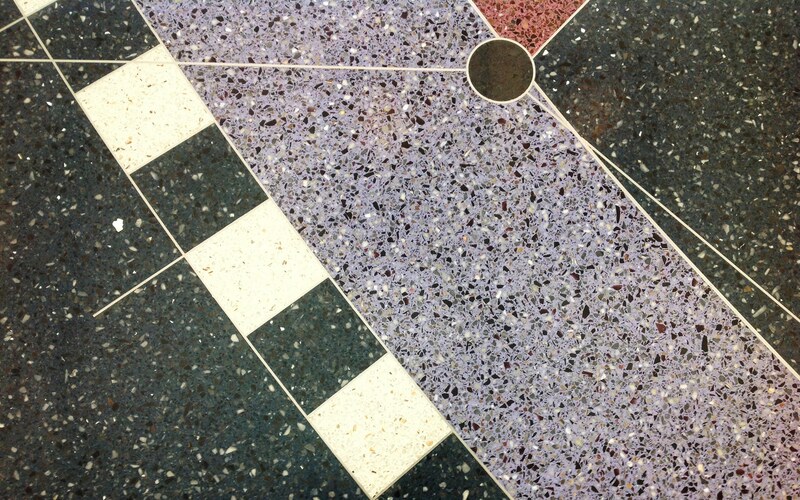 Numerous silver-coated, mirrored and mother-of-pearl shell pieces in the floor are meant to evoke the reflection of stars on the surface of the water. 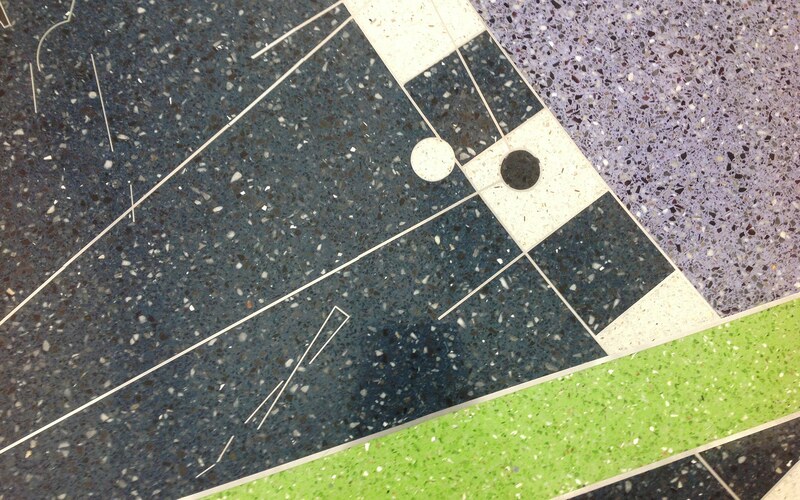 To convey a sense of navigation and discovery, I have included the image of an astrolabe which is set to the exact latitude for this section of the airport. The Museum of the History of Science at Oxford describes the astrolabe this way, “With ancient origins and a two thousand year history, the astrolabe illuminates astronomy, time-telling, astrology and religion across cultures, time and place.” There are more than 2,000 functions for the astrolabe, so it becomes the GPS, smartphone and even computer of centuries past. Visually, I enjoy the radial symmetry of an astrolabe and the sense of a globe it evokes for me with latitude and longitude lines. 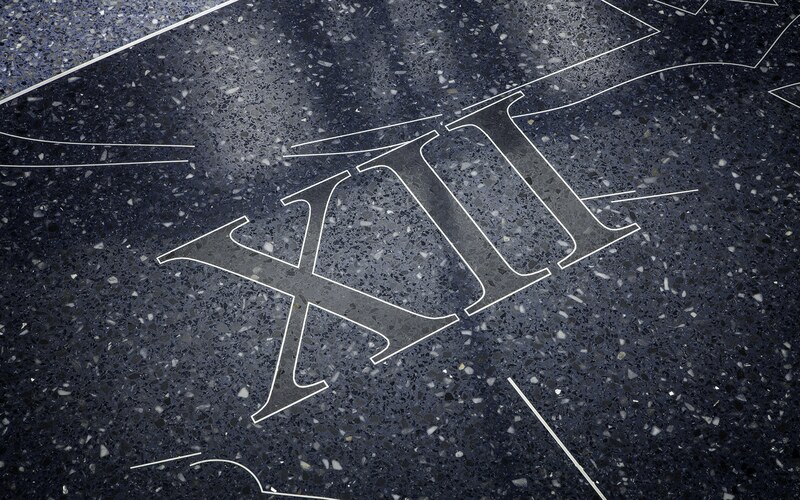 The Roman numerals tell another story of time and time-keeping which is ever present in airport travel itineraries. Other directional and wayfinding markers are layered into the design with reference to the wonder of the petroglyphs inscribed into the Sioux Red Quartzite at Jeffers Petroglyph Park. 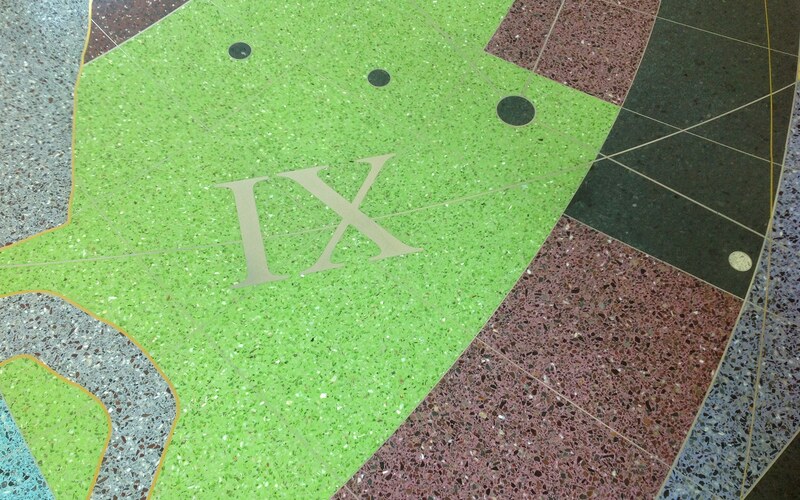 The imagery I sketched on site and some of the stone used in the aggregate mix is this same quartzite. 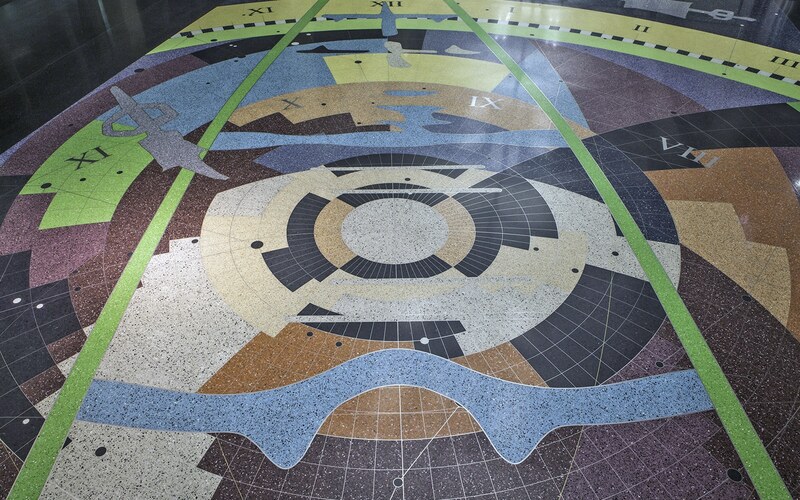 As airline passengers and visitors pass through this terminal, I want them to connect their own travels and adventures in Minnesota and beyond to this larger movement of history and discovery. 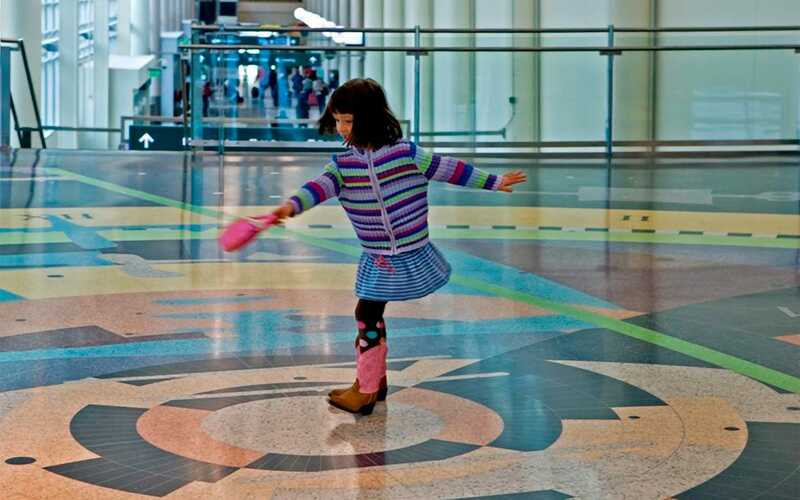 The story of humanity is one of a great journey: in a sense, we are all travellers. We locate ourselves in the stories that evoke our comings and goings, affirmed by the imagery which guides us in our discoveries of what might lay ahead and in our returning home. 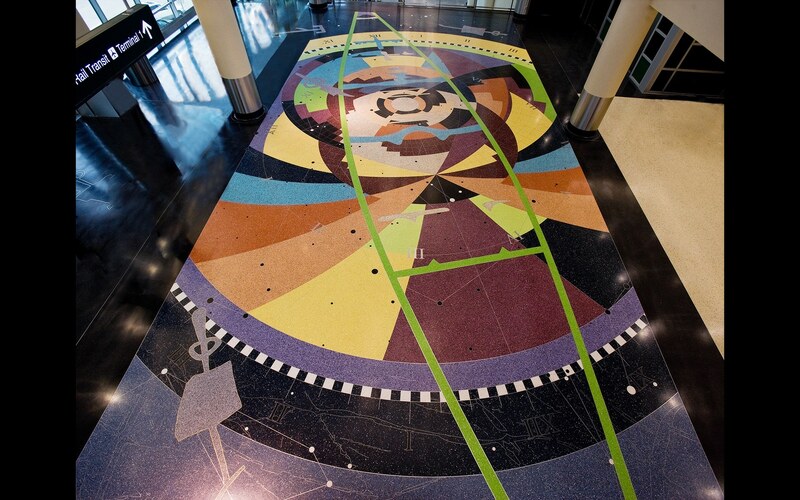 Starwheel: Maps, Metaphors and Cairns for the Journey is a 16-color epoxy terrazzo mosaic floor design for the north end of the Humphrey Terminal (Terminal 2) at the Minneapolis-Saint Paul International Airport. This project made a brief cameo on HGTV’s Vintage Flip, Season 2, Episode 8. Grazzini Brothers and Co., and National Metal Shapes, Inc.